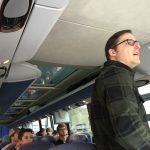 Dr. Derek Loftis of the Virginia Institute of Marine Science guest lectured and guided a Hampton Roads field trip for a UVA January-semester class focused on Civil Engineering in Coastal and Urban Environments taught by UVA Professors Michael Gorman and Jon Goodall. Dr. Loftis first prefaced the field trip with an hour-long guest lecture on hydrodynamic forecast modeling of Hurricanes Matthew and Hermine in Hampton Roads, attended by the class of 24 and Dr. Harry Wang from VIMS in the Dominion classroom of Andrew Hall. 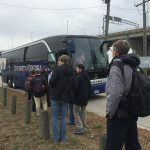 Then, a field trip around the Hampton Roads region commenced wherein Dr. Loftis guided the class to places where resilient infrastructure has been recently erected and to show the students places that flooded during Hurricane Matthew, which were depicted in the model animations from the lecture. 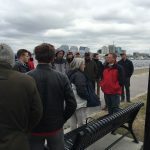 The field trip visited VIMS, Old Towne in Portsmouth, Ghent, the Hague, and Larchmont Neighborhoods in Norfolk, and Windsor Woods in Virginia Beach, and featured arranged/volunteered talks with city planners and officials. Norfolk GIS and Applications Coordinator, Kyle Spencer, describes the Ghent Neighborhood of Norfolk and his department’s retain your rain webapp to support Norfolk’s rain barrel and garden initiative to aid in retention of rooftop rainfall runoff. 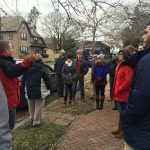 Portsmouth City Planner, Brian Swets, describes flooding revetments in Olde Towne Portsmouth. Boarding the UVA charter bus near the VIMS boat basin by the Coleman Bridge. 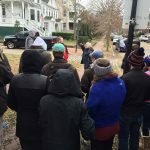 Portsmouth City Planner, Meg Pittenger, shows students the Portsmouth flood wall and duckbill drainage outflow pipes leading from Olde Towne to demonstrate how they prevent flooding back flow from the tides. More information on the Norfolk Retain the Rain app.